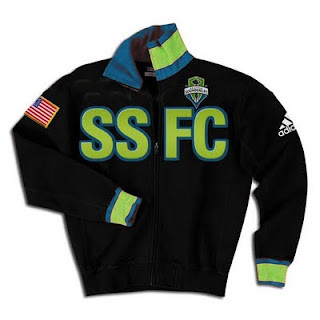 As a Seattle Sounders FC season ticket holder and huge supporter, I'm always looking for cool new Sounders' stuff. Having lived in and run Design Hovie Studios in Milan for years, I really liked the looks of the sweatshirts/sweaters sported by supporters of teams there. Shown above is a typical style seen on the streets in Italy promoting the local team. Although not commonly seen here in the States, I think it would be a top seller if produced for the Sounders. Here to hoping they agree.